Is long-form content right for you? It is so important to include precise, optimised content to avoid losing out on potential conversions. But, with long-form content proving to be highly effective when it comes to getting strong results, how can you provide useful information without producing ‘waffle-y’ content? And, does Google really prefer longer pieces? Long-form content is normally over 1,500 words and provides in-depth, useful information for readers. Proving how much you know about a particular topic is a way to establish authority in your field, gaining you credibility and trustworthiness amongst your audience. Once you have laid the foundations and taken the time to thoroughly research your article, you could begin to see a rise in traffic as people recognise the quality of your writing. SEO guru, Brian Dean, stated that “the average word count of a Google first page result is 1,890 words,” which is good news for all of you who love putting pen to paper! Of course, the more engagement on social networks, the more likely you are to receive backlinks from others referencing your site – which Google loves! Backlinks from websites with a high domain authority are most beneficial, as it results in a boost in your SEO ranking. 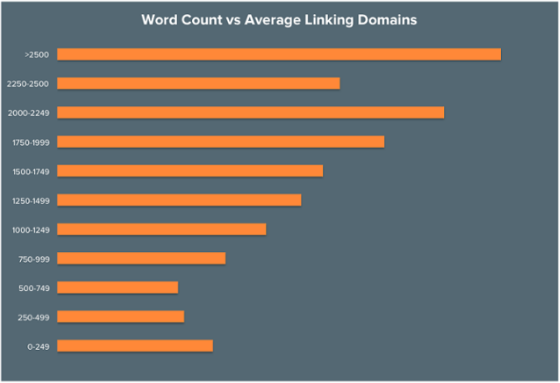 A study by HubSpot showed that articles with a word count over 2,500 earn the most backlinks, again reinforcing the idea that long-form content = higher Google ranking. This increase in traffic could lead to higher engagement on social platforms. 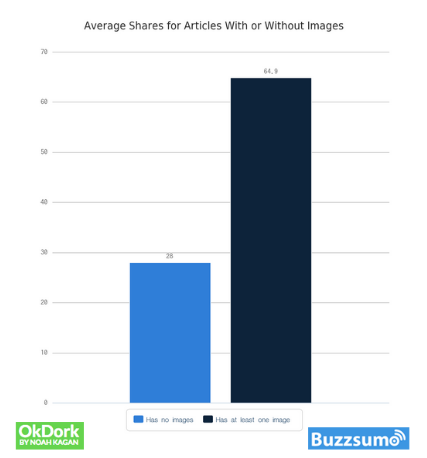 According to Buzzsumo, long-form content is more likely to get shared on social media; more specifically, 3,000-10,000 word content gets the most engagement. 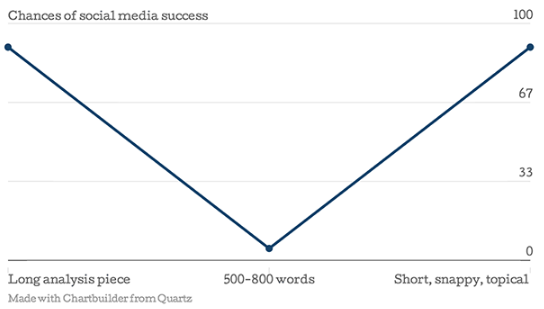 To show the difference your word count makes, a study by Kevin Delaney, the editor of Quartz, revealed that content between 500-800 words gets the least shares on social media, again suggesting that long-form is the way forward. It is all well and good getting lots of words on paper, but if these words do not provide real, helpful information for readers, it won’t receive the results you are hoping for. The trick is to write better content, and, as Neil Patel states, “better content is typically longer”. In-depth and meaningful writing involves covering as many relevant topics as possible while sticking to a content plan. This will ensure that you only write about what is actually useful, rather than writing for the sake of hitting the word count. 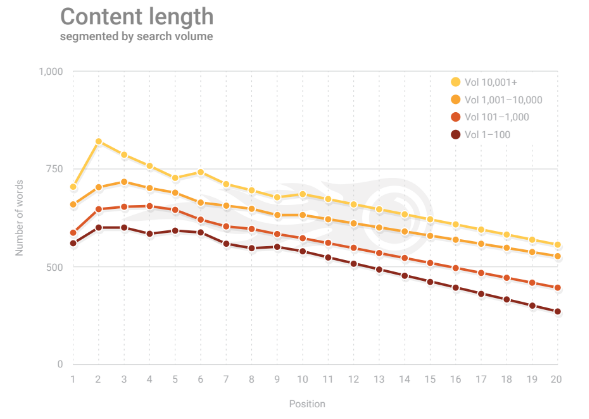 SEMrush concluded that “long-tail search queries return pages with more content on average than short heads — almost 20% more”. Therefore, look out for keywords with a large search volume; pages that rank for popular keywords have, on average, 1 and a half times more content! This will require some research into what words will be most successful in bringing visitors to your site. SEMrush’s keyword magic tool is a unique approach to finding the best keywords for you. Entering just one seed keyword will return many results and options for short- and long-tail words, displaying the volume and competitiveness of each. This will ensure that your written content will be optimised for a keyword that is not only relevant to you and your business, but also popular with your target audience who are searching for this term. Repeat your chosen keyword throughout your copy, but only where it is natural to do so. It can be tempting to shoehorn your keyword in as many times as possible, but this will become too obvious and distracting for your readers. As well as this, over-optimisation also sends a bad signal to search engines and can, in turn, damage your SEO ranking. Building a topic cluster will help to create a strong website presence. Start by creating a single ‘pillar page’, which acts as the main hub of information for one overarching topic. Within this page, link out to relevant blog posts which delve into the overarching topic in more detail. In turn, these blog posts should also connect back to the main pillar page using hyperlinked keywords. Now you have a cluster of connected content, which means that your site has a better chance of climbing up Google’s SERP. The last thing your reader wants to see are endless blocks of text without any breaks or visuals. Simply adding subheadings will make your copy accessible for those who are looking for quick answers. People like to be able to scan long pieces of content, therefore, including a bullet-pointed list at the beginning of your article will provide a quick overview – a bit like a contents page of a book – so that readers can understand exactly what they will gain by reading your content. Adding hyperlinks to these points which take the reader to the corresponding section will further improve your article’s accessibility. Using relevant images or helpful screenshots will enhance your writing and make your content more visually appealing. According to Noah Kagan, “on average, twice as many people share posts with at least one image in the post” – and we all know how important social sharing is! To further enhance your written content, you could include video. Videos can be powerful: we watch around 1 billion hours of YouTube social videos per day! That is a lot of video, so it is easy to see why so many are now using this form of content. According to HubSpot, 97% of marketers claim that videos help customers understand products. So, if you feel that it will add value to your article, why not get filming? Is Writing Long-Form Content Worth it? It is a question that needs to be addressed. With all the research it requires, not to mention briefing, planning, image sourcing, and even video recording, creating long-form content can end up taking up a lot of your time. Therefore, it is important to assess whether the benefits outweigh the drawbacks. Neil Patel carried out some research and found that the average typing speed is 40 words per minute. Therefore, writing an article that is 2,300 words long will take around 57 minutes, as long as you type without stopping. However, we all know that this is probably not going to happen – your article needs to be well-researched, planned, and concise. Therefore, brain-dumping your thoughts onto a page is unlikely to return strong results! More likely, it will take you 4, 5, 6 hours, or even longer, depending on your subject, your writing abilities, and editing process. What do you want to gain from your long-form content? It could be that you are looking for more traffic, or to increase high-quality conversions, or to push your SEO ranking further up the results page. If it is the latter, you may want to consider whether short-form is the way forward; Google doesn’t necessarily boost your article if it is longer – remember, quality is key. Are your customers wanting to read lots of content? It may seem like an obvious question to ask but nonetheless, it is a good point to note. In today’s world of mobile searching, people may not wish or need to scroll through 8,000-word articles on their phones when they could get the answers they need from watching a short video, for example. Having said this, it does depend on the topic; the more passionate people are about the subject, the higher the demand will be for written content. When done right, long-form content can produce great results. As long as what you are publishing is trustworthy, informative, well researched, and helpful, you could see very positive outcomes. So, click here to submit the request form.